I’ve mentioned Archie on several occasions in other stories, and it occurs to me that, A) people may have no idea about whom I’m talking, and 2) the references sound a little bit like some veiled contempt for an over the hill co-worker. Well, we’ll fix A and 2 is partly correct, but I’ll quantify and clarify below. Legend has it that Archie League was the first air traffic controller. 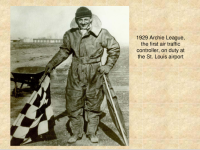 At left he is pictured at STL with the implements of control at the time—plain flag for “cleared” and checkered flag for “stop”. The system wasn’t very sophisticated. There are sources elsewhere that chronicle the details of his career, so I won’t rehash them here except to say that he wound up with the CAA (Civil Aviation Authority—the first Federal agency dealing with flight) and the FAA (both of them—the Federal Aviation Agency, created in 1958, and the Federal Aviation Administration, created nearly ten years later as an agency of the new Department of Transportation). 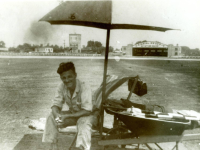 He served as the Director of the Air Traffic Division and was so revered, apparently, that an annual award for outstanding aviation service has been established in his name. As a professional grunt in the trenches, my attitude (almost certainly mirroring many of my co-workers) is that this is an image of a rush-ducking slacker. But that’s always the way we described anyone not bellying up to the radar and pushing metal like a man (or woman). In truth, it’s worthwhile to honor pioneers, if for no other reason than that they did something, probably difficult, in unknown arenas, probably difficult, and they were instrumental in fostering a process in which a great many of us were able to prosper. So, slacker or not, here’s to Archie League, the First Controller.